Many lakes are artificial and are constructed for industrial or agricultural use, for hydro-electric power generation or domestic water supply, or for aesthetic, recreational purposes, or other activities. The word lake comes from Middle English lake ("lake, pond, waterway"), from Old English lacu ("pond, pool, stream"), from Proto-Germanic *lakō ("pond, ditch, slow moving stream"), from the Proto-Indo-European root *leǵ- ("to leak, drain"). Cognates include Dutch laak ("lake, pond, ditch"), Middle Low German lāke ("water pooled in a riverbed, puddle") as in: de:Wolfslake, de:Butterlake, German Lache ("pool, puddle"), and Icelandic lækur ("slow flowing stream"). Also related are the English words leak and leach. There is considerable uncertainty about defining the difference between lakes and ponds, and no current internationally accepted definition of either term across scientific disciplines or political boundaries exists. For example, limnologists have defined lakes as water bodies which are simply a larger version of a pond, which can have wave action on the shoreline or where wind-induced turbulence plays a major role in mixing the water column. None of these definitions completely excludes ponds and all are difficult to measure. For this reason, simple size-based definitions are increasingly used to separate ponds and lakes. Definitions for lake range in minimum sizes for a body of water from 2 hectares (5 acres):331 to 8 hectares (20 acres) (see also the definition of "pond"). Charles Elton, one of the founders of ecology, regarded lakes as waterbodies of 40 hectares (99 acres) or more. 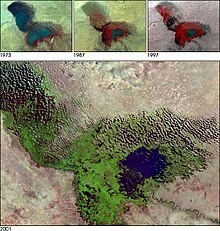 The term lake is also used to describe a feature such as Lake Eyre, which is a dry basin most of the time but may become filled under seasonal conditions of heavy rainfall. In common usage, many lakes bear names ending with the word pond, and a lesser number of names ending with lake are in quasi-technical fact, ponds. One textbook illustrates this point with the following: "In Newfoundland, for example, almost every lake is called a pond, whereas in Wisconsin, almost every pond is called a lake." The majority of lakes on Earth are freshwater, and most lie in the Northern Hemisphere at higher latitudes. Canada, with a deranged drainage system has an estimated 31,752 lakes larger than 3 square kilometres (1.2 sq mi) and an unknown total number of lakes, but is estimated to be at least 2 million. Finland has 187,888 lakes 500 square metres (5,400 sq ft) or larger, of which 56,000 are large (10,000 square metres (110,000 sq ft) or larger). 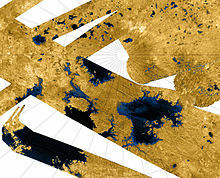 Evidence of extraterrestrial lakes exists; "definitive evidence of lakes filled with methane" was announced by NASA as returned by the Cassini Probe observing the moon Titan, which orbited the planet Saturn. Hutchinson in 1957 published a monograph that is regarded as a landmark discussion and classification of all major lake types, their origin, morphometric characteristics, and distribution. As summarized and discussed by these researchers, Hutchinson presented in it a comprehensive analysis of the origin of lakes and proposed what is a widely accepted classification of lakes according to their origin. This classification recognizes 11 major lake types that are divided into 76 subtypes. The 11 major lake types are tectonic lakes, volcanic lakes, landslide lakes, glacial lakes, solution lakes, fluvial lakes, aeolian lakes, shoreline lakes, organic lakes, anthropomorphic lakes, and meteorite (extraterrestrial impact) lakes. Tectonic lakes are lakes formed by the deformation and resulting lateral and vertical movements of the Earth’s crust. These movements include faulting, tilting, folding, and warping. Some of the well-known and largest lakes on Earth are rift lakes occupying rift valleys, e.g. Central African Rift lakes and Lake Baikal. Other well-known tectonic lakes, Caspian Sea, the Sea of Aral, and other lakes from the Pontocaspian occupy basins that have been separated from the sea by the tectonic uplift of the sea floor above sea level. Often, the tectonic action of crustal extension has created an alternating series of parallel grabens and horsts that form elongate basins alternating with mountain ranges. Not only does this promote the creation of lakes by the disruption of preexisting drainage networks, it also creates within arid regions endorheic basins that containing salt lakes (also called saline lakes). They form where there is no natural outlet, a high evaporation rate and the drainage surface of the water table has a higher-than-normal salt content. Examples of these salt lakes include Great Salt Lake and the Dead Sea. Another type of tectonic lake caused by faulting is sag ponds. Volcanic lakes are lakes that occupy either local depressions, e.g. craters and maars or larger basins, e.g. calderas, created by volcanism. Crater lakes are formed in volcanic craters and calderas, which fill up with precipitation more rapidly than they empty via either evaporation, groundwater discharge, or combination of both. 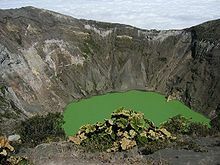 Sometimes the latter are called caldera lakes, although often no distinction is made. An example is Crater Lake in Oregon, in the caldera of Mount Mazama. The caldera was created in a massive volcanic eruption that led to the subsidence of Mount Mazama around 4860 BCE. Other volcanic lakes are created when either rivers or streams are dammed by lava flows or volcanic lahars. The basin which is now Malheur Lake, Oregon was created when a lava flow dammed the Malheur River. Glacial lakes are lakes created by the direct action of glaciers and continental ice sheets. A wide variety of glacial processes create enclosed basins. As a result, there are a wide variety of different types of glacial lakes and it is often difficult to define clear-cut distinctions between different types of glacial lakes and lakes influenced by other activities. The general types of glacial lakes that have recognized are lakes in direct contact with ice; glacially carved rock basins and depressions; morainic and outwash lakes; and glacial drift basins. Glacial lakes are the most numerous lakes in the world. Most lakes in northern Europe and North America have been either influenced or created by the latest, but not last, glaciation, to have covered the region. Glacial lakes include proglacial lakes, subglacial lakes, finger lakes, and epishelf lakes. Epishelf lakes are highly stratified lakes in which a layer of freshwater, derived from ice and snow melt, is dammed behind an ice shelf that is attached to the coastline. They are mostly found in Antarctica. Fluvial (or riverine) lakes are lakes produced by running water. These lakes include plunge pool lakes, fluviatile dams and meander lakes. The most common type of fluvial lake is a crescent-shaped lake called an oxbow lake due to the distinctive curved shape. They can form in river valleys as a result of meandering. The slow-moving river forms a sinuous shape as the outer side of bends are eroded away more rapidly than the inner side. Eventually a horseshoe bend is formed and the river cuts through the narrow neck. This new passage then forms the main passage for the river and the ends of the bend become silted up, thus forming a bow-shaped lake. These form where sediment from a tributary blocks the main river. These form where sediment from the main river blocks a tributary, usually in the form of a levee. A solution lake is a lake occupying a basin formed by surface dissolution of bedrock. In areas underlain by soluble bedrock, its solution by precipitation and percolating water commonly produce cavities. These cavities frequently collapse to form sinkholes that form part of the local karst topography. Where groundwater lies near the grounds surface, a sinkhole will be filled water as a solution lake. If such a lake consists of a large area of standing water that occupies an extensive closed depression in limestone, it is also called a karst lake. Smaller solution lakes that consist of a body of standing water in a closed depression within a karst region are known as karst ponds. Limestone caves often contain pools of standing water, which are known as underground lakes. Classic examples of solution lakes are abundant in the karst regions at the Dalmatian coast of Croatia and within large parts of Florida. Landslide lakes are lakes created by the blockage of a valley by either mudflows, rockslides, or screes. Such lakes are common in mountainous regions. Although landslide lakes may be large and quite deep, they are typically short-lived. An example of a landslide lake is Quake Lake, which formed as a result of the 1959 Hebgen Lake earthquake. Aeolian lakes are lakes produced by wind action. They are found mainly in arid environments although some aeolian lakes are relict landforms indicative of arid paleoclimates. Aeolian lakes consist of lake basins dammed by wind-blown sand; interdunal lakes that lies between well-oriented sand dunes; and deflation basins formed by wind action under previously arid paleoenvironments. Moses Lake, Washington, is an example of a lake basins dammed by wind-blown sand. Shoreline lakes are generally lakes created by blockage of estuaries or by the uneven accretion of beach ridges by longshore and other currents. They include maritime coastal lakes, ordinarily in drowned estuaries; lakes enclosed by two tombolos or spits connecting an island to the mainland; lakes cut off from larger lakes by a bar; or lakes divided by the meeting of two spits. Organic lakes are lakes created by the actions of plants and animals. On the whole they are relatively rare in occurrence and quite small in size. In addition, they typically ephemeral features relative to the other types of lakes. The basins in which organic lakes occur are associated with beaver dams, coral lakes, or dams formed by vegetation. Peat lakes are a form of organic lake. They form where a buildup of partly decomposed plant material in a wet environment leaves the vegetated surface below the water table for a sustained period of time. They are often low in nutrients and mildly acidic, with bottom waters low in dissolved oxygen. Anthropogenic lakes are artificially created lakes formed by human activity. They can be the result of intentional damming of rivers and streams or subsequent filling of abandoned excavations by either ground water, precipitation, or a combination of both. Meteorite lakes, which are also known as crater lakes, are lakes created by catastrophic extraterrestrial impacts by either meteorites or asteroids. Examples of meteorite lakes are Lonar crater lake, India, Lake Elgygytgyn, and Pingualuit crater lake, Quebec, Canada, As in case of Lake El'gygytgyn and Pingualuit crater lake, meteorite (extraterrestrial impact/ crater) lakes can contain unique and scientifically valuable sedimentary deposits associated with long records of paleoclimatic changes. In addition to their origin, there are various other ways of either naming or defining types of lakes. One major way of classification lakes in on the basis of thermal stratification because it is a major control on animal and plant life inhabiting a lake and the fate and distribution of dissolved and suspended material in a lake. For example, the thermal stratification and the degree and frequency of mixing exerts a strong control on the distribution of oxygen within it. In addition, lake can be classified according important factors such as seasonal variations in lake volume and level, oxygen saturation, and salinity of its water mass. Finally, the names of types of lakes that are used by the lay public and in the scientific for different types of lakes are often informally derived from either from their morphology of other aspects or their physical characteristics. F.A. Forel, who is also referred to as the father of limnology, was the first scientist to classify lakes according to their thermal stratification. His system of classification was later modified and improved upon by Hutchinson and Laffler. Because the density of water varies with temperature, with a maximum at +4 DC, thermal stratification is an important physical characteristic of lakes that controls the fauna and flora, sedimentation, chemistry, and other aspects of individual lakes. First, the colder, heavier water typically forms a layer near the bottom, which called the hypolimnion. Second, normally overlying it is a transition zone known as the metalimnion. Finally, overlying the metalimnion is a surface layer of a warmer, lighter water is called the epilimnion. However, this typical stratification sequence can vary widely depending either on the specific lake, the time of season, or combination of both. Based upon thermal stratification, lakes are classified as either holomictic lakes or meromictic lakes. A meromictic lake is a lake which has layers of water which do not intermix. The deepest layer of water in such a lake does not contain any dissolved oxygen. In addition, the layers of sediment at the bottom of a meromictic lake remain relatively undisturbed because there are no living aerobic organisms. The lack of disturbance allows for the development of lacustrine varves. A Holomictic lake is a lake that has a uniform temperature and density from top to bottom at a specific time during the year. This uniformity temperature and density in allows the lake waters to completely mix. Holomictic lakes are non-meromictic lakes. Based upon thermal stratification and frequency of turnover, holomictic lakes are divided into amictic lakes, cold monomictic lakes, dimictic lakes, warm monomictic lakes, polymictic lakes, and oligomictic lakes. The classification of lakes by thermal stratification presupposes lakes with sufficient depth to form a hypolimnion. As a results, very shallow lakes are excluded this classification system. The stratification in a lake is not always the result of variation to density because of thermal gradients. Stratification within a lake can also be the result of differences in density resulting from gradients in salinity. In case of a difference in salinity, the hypolimnion and epilimnion are separated not by a thermocline but by a halocline, which is sometimes referred to as a chemocline. Dry lake is a popular name for an ephemeral lake that contains water only intermediately at irregular and infrequent intervals. Perennial lake is a lake that has water in its basin throughout the year and is not subject to extreme fluctuations in level. Playa lake is a typically shallow, intermittent lake that covers or occupies a playa either in wet seasons or in especially wet years but subsequently drying up in an arid or semiarid region. Vlei is a name used in South Africa for a shallow lake which varies considerably in level with the seasons. An acid lake is a lake that has a pH is below neutral (<6.5). A lake is considered highly acidic when the pH drops below 5.5, below which when biological consequences occur. Such lakes include acid pit lakes occupying abandoned mines and excavations; naturally acid lakes of igneous and metamorphic landscapes; peat bogs in northern regions; acid-saline lakes of arid environments; crater lakes of active and dormant volcanoes; and lakes acidified by acid rain. A salt lake, which also known as a brine lake, is an inland body of water situated in an arid or semiarid region, having no outlet to the sea, and containing a high concentration of dissolved salts (principally sodium chloride). Examples include the Great Salt Lake in Utah, and the Dead Sea in the Near East. alkali sink, also known as salt flats, are lakes on the other extreme of the scale from the large and deep saline lakes. They are, shallow saline features that occupy low-lying areas of the arid regions and in groundwater discharge zones. These are typically classifiable as either playas or playa lakes because they are periodically flooded by either rain or flood events and then dry up during drier intervals, leaving accumulations of brines and evaporitic minerals. A salt pan (saltpan) is either an undrained small shallow natural depression in which water accumulates and evaporates leaving a salt deposit or the shallow lake of brackish water occupying a salt pan. This term is also used for a large pan for recovering salt by evaporation. A saline pan is a name for an ephemeral saline lake which precipitates a bottom crust that is subsequently modified during subaerial exposure. Lava lake is a large volume of molten lava, usually basaltic, contained in a volcanic vent, crater, or broad depression. Hydrocarbon lakes are bodies of liquid ethane and methane that occupy depressions on the surface of Titan. They were detected by the Cassini–Huygens space probe. A paleolake, also spelt palaeolake, is a lake that existed in the past when hydrological conditions were different. Quaternary paleolakes can often be identified on the basis of relict lacustrine landforms such as relict lake plains and coastal landforms that form recognizable relict shorelines, which are called paleoshorelines. Paleolakes can also be recognized by characteristic sedimentary deposits that accumulated in them and any fossils that these sediments might contain. The paleoshorelines and sedimentary deposits of paleolakes provide evidence for prehistoric hydrological changes during the times that they existed. A former lake is a lake which is no longer in existence. Such lakes include prehistoric lakes and lakes which have permanently dried up often as the result of either evaporation or human intervention. Owens Lake in California, USA, is an example of a former lake. Former lakes are a common feature of the Basin and Range area of southwestern North America. A shrunken lake is a lake which has drastically decreased in size over geological time. Lake Agassiz, which once covered much of central North America, is a good example of a shrunken lake. Two notable remnants of this lake are Lake Winnipeg and Lake Winnipegosis. Paleolakes are of scientific and economic importance. For example, Quaternary paleolakes in semidesert basins are important for two reasons. First, they played an extremely significant, if transient, role in shaping the floors and piedmonts of many basins. Finally, their sediments contain enormous quantities of geologic and paleontologic information concerning past environments. In addition, the organic-rich deposits of pre-Quaternary paleolakes are important either for the thick deposits of oil shale and shale gas that they contain or as source rocks of petroleum and natural gas. Although of significantly less economic importance, strata deposited along the shore of paleolakes sometimes contain coal seams. Jupiter's large moon Io is volcanically active, and as a result sulfur deposits have accumulated on the surface. Some photographs taken during the Galileo mission appear to show lakes of liquid sulfur in volcanic caldera, though these are more analogous to lake of lava than of water on Earth. The planet Mars has only one confirmed lake; it is underground and near the south pole. However, the surface of Mars is too cold and has too little atmospheric pressure to permit permanent surface water. Geologic evidence appears to confirm, however, that ancient lakes once formed on the surface. It is also possible that volcanic activity on Mars will occasionally melt subsurface ice, creating large temporary lakes. This water would quickly freeze and then sublimate, unless insulated in some manner, such as by a coating of volcanic ash. 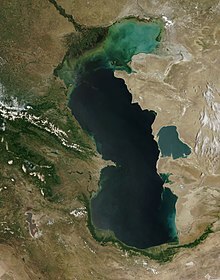 The largest lake by surface area is Caspian Sea, which is despite its name considered as a lake from the point of view of geography. Its surface area is 143,000 sq. mi./371,000 km2. Lake Baikal is the deepest lake in the world, located in Siberia, with a bottom at 1,637 metres (5,371 ft). Its mean depth is also the greatest in the world (749 metres (2,457 ft)). 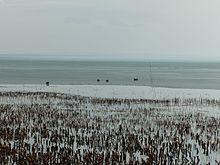 It is also the world's largest freshwater lake by volume (23,600 cubic kilometres (5,700 cu mi), but much smaller than the Caspian Sea at 78,200 cubic kilometres (18,800 cu mi)), and the second longest (about 630 kilometres (390 mi) from tip to tip). The world's oldest lake is again, Lake Baikal, followed by Lake Tanganyika in ￼Tanzania￼￼. Lake Maracaibo is considered by some to be the second-oldest lake on Earth, but since it lies at sea level and nowadays is a contiguous body of water with the sea, others consider that it has turned into a small bay. It is also the third largest by volume, the second oldest, and the second deepest (1,470 metres (4,820 ft)) in the world, after Lake Baikal. The world's lowest lake is the Dead Sea, bordered by Jordan to the east and Israel and Palestine to the west, at 418 metres (1,371 ft) below sea level. It is also one of the lakes with highest salt concentration. The largest island in a lake is Manitoulin Island in Lake Michigan-Huron, with a surface area of 2,766 square kilometres (1,068 sq mi). Lake Manitou, on Manitoulin Island, is the largest lake on an island in a lake. The largest lake in one country is Lake Michigan, in the United States. However, it is sometimes considered part of Lake Michigan-Huron, making the record go to Great Bear Lake, Northwest Territories, in Canada, the largest lake within one jurisdiction. ^ Purcell, Adam. "Lakes". Basic Biology. ^ "Dictionary.com definition". Retrieved 2008-06-25. ^ The Caspian Sea is generally regarded by geographers, biologists and limnologists as a huge inland salt lake. However, the Caspian's large size means that for some purposes it is better modeled as a sea. Geologically, the Caspian, Black and Mediterranean seas are remnants of the ancient Tethys Ocean. Politically, the distinction between a sea and a lake may affect how the Caspian is treated by international law. ^ Williams, Penny; Whitfield, Mericia; Biggs, Jeremy; Bray, Simon; Fox, Gill; Nicolet, Pascale; Sear, David (2004). "Comparative biodiversity of rivers, streams, ditches and ponds in an agricultural landscape in Southern England" (PDF). Biological Conservation. 115 (2): 329–341. doi:10.1016/S0006-3207(03)00153-8. Archived from the original (PDF) on 2011-09-12. Retrieved 2009-06-16. ^ Moss, Brian; Johnes, Penny; Phillips, Geoffrey (1996). "The monitoring of ecological quality and the classification of standing waters in temperate regions". Biological Reviews. 71 (2): 301–339. doi:10.1111/j.1469-185X.1996.tb00750.x. Archived from the original on 2013-01-05. Retrieved 2009-06-16. ^ "Information Sheet on Ramsar Wetlands (RIS)". Ramsar Convention on Wetlands. Archived from the original on March 4, 2009. Retrieved 2 March 2013. ^ Elton, Charles Sutherland; Miller, Richard S. (1954). "The Ecological Survey of Animal Communities: With a Practical System of Classifying Habitats by Structural Characters". The Journal of Ecology. 42 (2): 460–496. doi:10.2307/2256872. JSTOR 2256872. ^ Thomas V. Cech (2009). Principles of Water Resources: History, Development, Management, and Policy. John Wiley & Sons. p. 83. ISBN 978-0-470-13631-7. ^ M. Shahin (2002). Hydrology and Water Resources of Africa. Springer. p. 427. ISBN 978-1-4020-0866-5. ^ Index Copernicus (2004). Ecohydrology & Hydrobiology 2004. Index Copernicus. p. 381. ISSN 1642-3593. ^ Carreck, Rosalind, ed. (1982). The Family Encyclopedia of Natural History. The Hamlyn Publishing Group. p. 205. ISBN 978-0-7112-0225-2. ^ Downing, J.A. ; Prairie, Y. T.; Cole, J.J.; Duarte, C.M. ; Tranvik, L.J. ; Striegl, R.G. ; McDowell, W.H. ; Kortelainen, P.; Caraco, N.F. ; Melack, J.M. (2006). "The global abundance and size distribution of lakes, ponds, and impoundments". Limnology and Oceanography. 51 (5): 2388–2397. Bibcode:2006LimOc..51.2388D. doi:10.4319/lo.2006.51.5.2388. ISSN 0024-3590. ^ a b c d e f g h i j k l Hutchinson, G.E. 1957. A treatise on limnology, v. 1. Geography, Physics and Chemistry. Wiley. 1015p. ^ a b c d e f g h i j Cohen, A.S., 2003.Paleolimnology: the history and evolution of lake systems. Oxford University Press. ^ a b c d e f g h i j k l m n o p q Håkanson, L., and Jansson, J., 1983. Principles of Lake Sedimentology. Springer-Verlag, New York. 320 pp. ^ a b c d e f g h i j k l m Håkanson, L., 2012. Lakes on Earth, Different Types. In Encyclopedia of Lakes and Reservoirs (pp. 471–472). Springer Netherlands. ^ Veillette, J., Mueller, D.R., Antoniades, D. and Vincent, W.F., 2008. Arctic epishelf lakes as sentinel ecosystems: Past, present and future. Journal of Geophysical Research: Biogeosciences, 113(G04014). 11 p.
^ a b Mosley, Paul. "Geomorphology and Hydrology of Lakes" (PDF). ^ Schoenherr, Allan A. (2017). A Natural History of California: Second Edition. University of California Press. p. 485. ISBN 978-0-520-96455-6. ^ a b c d e f g h Neuendorf, K.K.E., Mehl Jr., J.P., and Jackson, J.A., 2005. Glossary of Geology, 5th revised and enlarged ed. Berlin: Springer. Approx. 900 p. ISBN 3-540-27951-2. ^ Myers, W.B. and Hamilton, W., 1964. The Hebgen Lake, Montana, earthquake of August 17, 1959. Geological Survey Professional Paper, 435, p. 51. ^ "Peat lakes". Waikato Regional Council. Retrieved 2018-04-24. ^ Maloof, A.C., Stewart, S.T., Weiss, B.P., Soule, S.A., Swanson-Hysell, N.L., Louzada, K.L., Garrick-Bethell, I. and Poussart, P.M., 2010. Geology of lonar crater, India. Geological Society of America Bulletin, 122(1–2), pp. 109–126. ^ a b Wennrich, V., Andreev, A.A., Tarasov, P.E., Fedorov, G., Zhao, W., Gebhardt, C.A., Meyer-Jacob, C., Snyder, J.A., Nowaczyk, N.R., Schwamborn, G. and Chapligin, B., 2016. Impact processes, permafrost dynamics, and climate and environmental variability in the terrestrial Arctic as inferred from the unique 3.6 Myr record of Lake El'gygytgyn, Far East Russia–A review. Quaternary Science Reviews, 147, pp. 221–244. ^ a b Desiage, P.A., Lajeunesse, P., St-Onge, G., Normandeau, A., Ledoux, G., Guyard, H. and Pienitz, R., 2015. Deglacial and postglacial evolution of the Pingualuit Crater Lake basin, northern Québec (Canada). Geomorphology, 248, pp. 327–343. ^ Forel, F.A., 1901. Handbuch der Seenkunde. Allgemeine Limnologie. J. von Engelhorn, Stuttgart, Germany. ^ a b Loffler, H., 1957. Die klimatischen Typen des holomiktischen Sees. Mitteilungen der Geographischen Gesellschaft, 99, pp. 35–44. ^ a b c d Hutchinson, G.E. and Löffler, H., 1956. The thermal classification of lakes. Proceedings of the National Academy of Sciences, 42(2), pp. 84–86. ^ a b Gangstad, E.O., 1979. Glossary of Biolimnological Terms. Washington, DC, United States Army Corps of Engineers. 22 p.
^ "Lakes – Aquatic Havens". Retrieved 2017-10-25. ^ a b c d Last, W.M. and Smol, J.P., 2001. Tracking environmental change using lake sediments. Volume 1: basin analysis, coring, and chronological techniques. Springer Science & Business Media. ^ Theal, G.M., 1877. Compendium of South African history and geography, 3rd. Institution Press, Lovedale, South Africa. ^ Patrick, R., Binetti, V.P. and Halterman, S.G., 1981. Acid lakes from natural and anthropogenic causes. Science, 211(4481), pp. 446–448. ^ Witham, F. and Llewellin, E.W., 2006. Stability of lava lakes. Journal of Volcanology and Geothermal Research, 158(3), pp. 321–332. ^ Mastrogiuseppe, M., Poggiali, V., Hayes, A., Lorenz, R., Lunine, J., Picardi, G., Seu, R., Flamini, E., Mitri, G., Notarnicola, C. and Paillou, P., 2014. The bathymetry of a Titan sea. Geophysical Research Letters, 41(5), pp. 1432–1437. ^ Goudie, A., 2008. Arid Climates and Indicators. Gornitz, V. ed., 2008. Encyclopedia of paleoclimatology and ancient environments. Springer Science & Business Media. pp 45–51. ^ Currey, D.R., 1990. Quaternary palaeolakes in the evolution of semidesert basins, with special emphasis on Lake Bonneville and the Great Basin, USA. Palaeogeography, Palaeoclimatology, Palaeoecology, 76(3–4), pp. 189–214. ^ Schnurrenberger, D., Russell, J. and Kelts, K., 2003. Classification of lacustrine sediments based on sedimentary components. Journal of Paleolimnology, 29(2), pp. 141–154. ^ Forbes, Stephen. "The Lake as a Microcosm". "Bulletin of the Peoria Scientific Association" vol. 87, 1887. pp. 77–87. ^ The Nine Planets Solar System Tour. "Io". Retrieved 2008-08-07. ^ Greicius, Tony (2018-07-25). "NASA Statement on Possible Subsurface Lake near Martian South Pole". NASA. Retrieved 2018-10-15. ^ Council), GMAC (Graduate Management Admission (2014-06-26). The Official Guide for GMAT Review 2015 with Online Question Bank and Exclusive Video. John Wiley & Sons. ISBN 978-1-118-91410-6. ^ "China wetlands" (PDF). Ramsar Wetlands International. p. 77. Archived from the original (PDF) on 2013-06-17. Retrieved 2012-02-06.